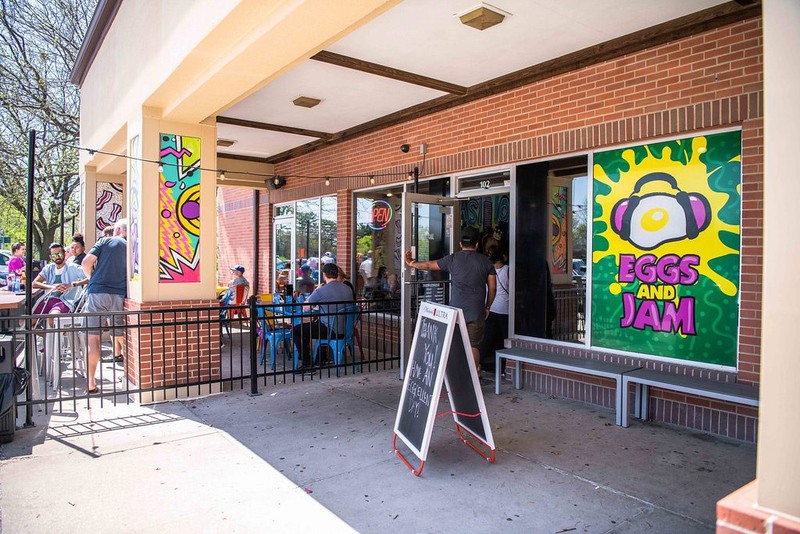 Eggs and Jam is Des Moines area’s only hip-hop themed breakfast and lunch spot. From East Toast to West Toast people are talking about our 90’s-hip-hop fueled retro cafe. Eggs and Jam pays homage to simpler times when the beats were as fresh as the food we serve. We offer a full track of healthy breakfast-inspired options as well as many of the comfort food favorites — all named after your favorite 90’s hits. From ‘The Roots’ veggie omelette to the ‘Ludabiscuits’ and gravy, you’ll be sure to find something that fits your flavor. Thirsty? — Grab a chart-topping themed cocktail like the ‘Gin and Juice’ or get jiggy with an ‘I Just Crush A Lot’ mimosa flight to start the day off right. With golden-era, hip-hop soundtracks starring artists like Nas, Beastie Boys, and Snoop coming out of the speakers the shop serves up nostalgia by the mouthful. Street art murals and urban flair will have you in full throwback mode while we expand the boundaries of your taste buds. The atmosphere is lively, the servings are generous and the flavors are decadent. Eggs and Jam is a food experience you won’t soon forget! Copyright © 2018 Eggs And Jam. Crafted by Firefly Creative.